Using specialized parts of their bodies for tools and working with materials they find around them or produce organically, some animals construct spectacular structures that provide them with shelter, safety, and easy access to food. Their anatomy has evolved over generations to help them in their efforts to build their ideal homes. Without its fast-growing teeth, a beaver could not cut the wood to build its lodge; without its unusual type of saliva, a cave swiftlet could not create its crystal nest; and without silk glands, a spider could not weave its geometric home. When it comes to building homes, anatomy counts. Here’s a look at a few animals featured in The Animal House, and the anatomical features they possess that allow them to build their home sweet homes. 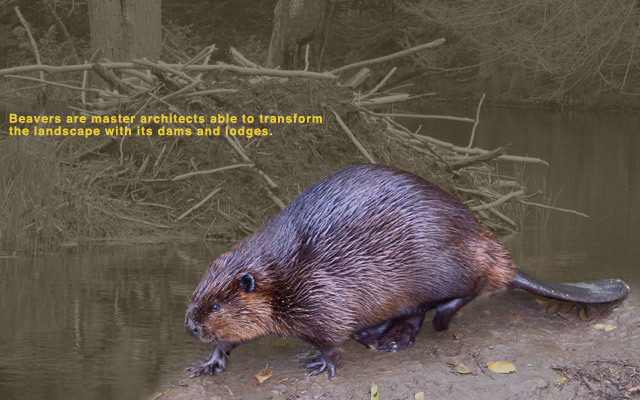 Beavers have powerful teeth to cut trees and other plants that they use to build their lodges and dams. Their teeth erode about an inch per month from gnawing on all that wood, but they grow at an incredible rate – ten times faster than our fingernails. The teeth are reinforced with iron, which turns them orange, and to maintain sharpness, the incisors have a self-sharpening wear pattern. 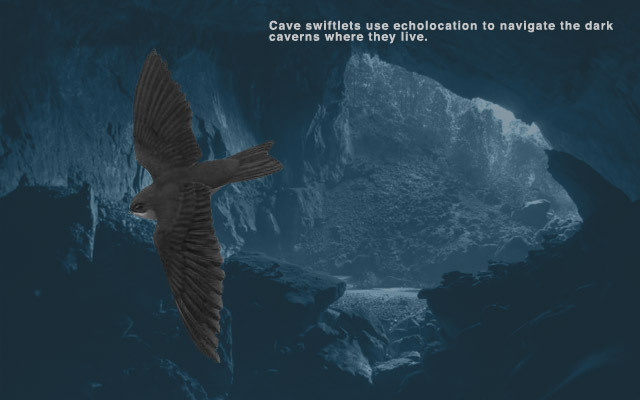 Living in caves, swiftlets rely on echolocation to navigate in the dark. They are one of the few birds to do so. They make powerful clicks and listen to the echoes produced to determine their own location in relation to nearby objects. Their short legs aren’t particularly good for perching, but they are perfect for clinging to vertical surfaces like cave walls. The birds’ nests are built entirely out of gluey saliva that hardens as it dries. 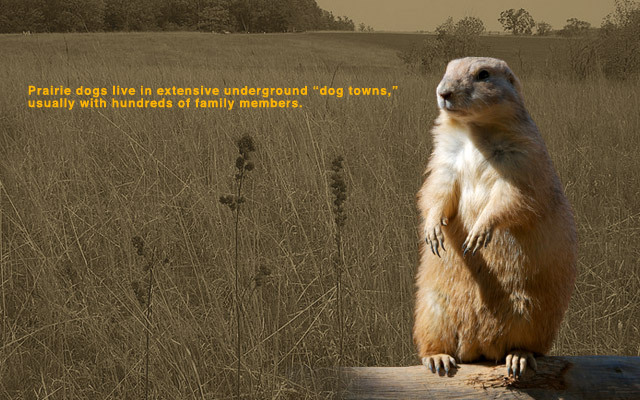 Prairie dogs live in an underground colony called a dog town, which can stretch over open grasslands for miles. They are expert diggers, thanks to their sharp claws. Their burrows are extensive and contain an elaborate tunnel system with specialized rooms. Spiders produce silk in special glands located in their abdomen. Different silk glands produce different types of silk, released through one of two spinnerets located at the base of the abdomen. Webs are generally constructed of two types of silk: one that is strong and stretchy, and another that’s sticky for catching prey. 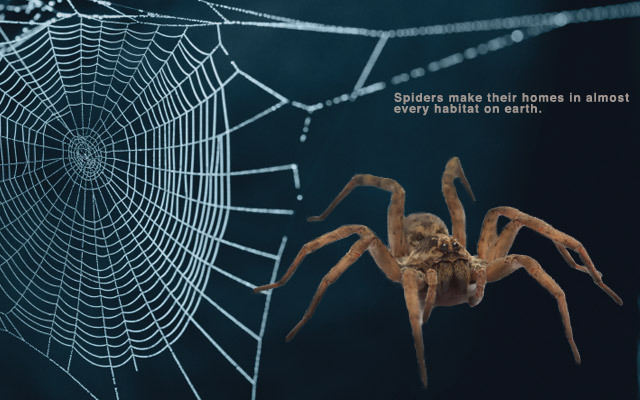 Tiny hairs sensitive to vibration cover their bodies, alerting them to the type of prey that hits their web. 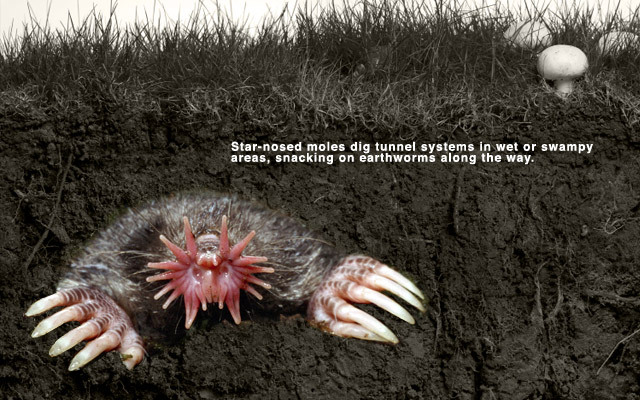 Star-nosed moles use their large claws to dig networks of shallow tunnels near water. They have relatively poor eyesight and rely on their unique nose to get around. It’s equipped with twenty-two tentacles covered with minute touch receptors known as Eimer’s organs which convey a detailed sensory map of the mole’s surroundings. While burrowing, the tentacles also block the nostrils to prevent soil from entering the nose.